OrthoWorx today announced that David K. Floyd, a 1983 Grace College grad, will join the Warsaw, Indiana-based community group as Chief Executive Officer, effective September 6, 2011. Mr. Floyd most recently served as Worldwide President of DePuy Orthopaedics, a Johnson & Johnson Company headquartered in Warsaw. Mr. Floyd was a founding member of the OrthoWorx Board of Directors and served on the board until April 2011. He also has served as chair of the organization’s Transportation and Logistics Initiative. He began his orthopedic industry career at Zimmer in Warsaw in 1987 and is a graduate of Grace College in Winona Lake, Indiana. “I am delighted to join OrthoWorx and to be able to draw on my experiences in leadership and in the orthopedic industry in a different way—to help the Warsaw region continue to thrive as the orthopedic capital of the world,” said Mr. Floyd. 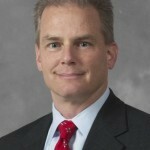 Mr. Floyd joined DePuy Orthopaedics as U.S. President in September 2007, coming from Abbott Spine, where he served as President of the worldwide spine business. He has held executive leadership positions in several companies, including President of Centerpulse Orthopedics and President and CEO of AxioMed Spine Corporation. He is an alumnus of the Miller Graduate School of Business at Ball State University and the Kosciusko Leadership Academy. He serves as a Director of the Orthopedic Capital Foundation and on the President’s Advisory Council and the Strategic Planning Committee for Grace College.